It occurred to me this weekend that I haven’t written about going aloft in quite some time1, which is especially egregious given that I’m a birder these days. 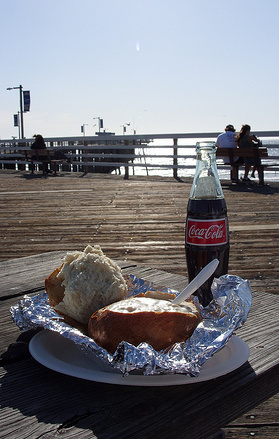 Multi-hundred dollar bread-bowl of clam chowder. We happened to get Good Friday off2, so I decided to reserve a plane for ten hours to go… somewhere, on the off chance that the weather would be good. The weather turned out to be beautiful! I didn’t have the time to really do any flight planning, so I ended up asking a close friend to head down to San Luis Obispo, the town of my alma mater, for a $600 bowl of clam chowder which, since I’ve flown the route more-fingers-than-I-have times, requires all of five minutes of flight planning3. We ended up going down the coastal route instead of the inner-Salinas Valley route4, which provided great beach views for almost ninety minutes. Plus, I was able to enjoy the fifty-plus miles of visibility on the flight back by having my friend fly us home5. My friend saw fit to capture the flight with his new camera, documenting both his expert pre-flight suggestion and a secret routine all pilots conduct before every flight, but that is an entirely unmentionable ritual of the industry. The entire Flicker6 set here. 2 which is no one else in the known Government Holiday-world ™ seems to get off, but on the other hand, it’s smack dab in the middle of MLK-day and Memorial Day, so it turns out to be a better distribution of holiday-ness. 3 I mean, what’s easier than KNUQ VPLEX SNS SARDO—you want to be sure to avoid restricted-2504—PRB direct?!! The US stock markets got the day off, too; are they considered part of the “known Government Holiday-world ™”? Since the government has taken to bailing them all out, yes! It’s nice to be back… hopefully, I’ll get around to blogging about build stuff again shortlyish. (I do have a lot to say… it’s just typically easier to write flying posts. More fun, too.